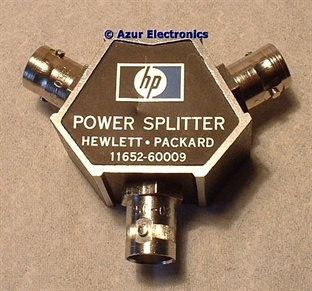 This Power Splitter is part of the HP 11652A Reflection/Transmission Kit which is used for making transmission and reflection measurements from 100kHz to 110MHz and also contains the 8721A Directional Bridge. It is intended for use with the 8601A Generator Sweeper and the 8407A Network Analyser. The Kit cost $475 in 1980. 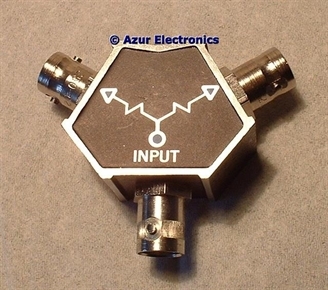 This is a 2 resistor device with a 6dB insertion loss at 50Ω impedance. Bought a 11652-60009 on eBay UK but testing revealed that it was open-circuit on both ports, probably due to an input power overload. Instantly refunded by the seller (thanks Bryan). Have now bought another 11652-60009 and this one tested ok.